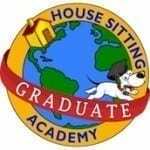 We are founding members and graduates of the House Sitting Academy. We can highly recommend having Jane and Duncan from To Travel Too house sit for you. No problem was too big and our animals were well cared for. It was nice being able to go away, knowing that our pets were in good hands and when we returned, the house was all in good order. Jane and Duncan are a great couple. You can rest assured that your home and your beloved pets will be well cared for. They have a natural affinity with animals and our 2 dogs took to them both immediately. I have no hesitation in recommending them to any prospective people out there looking for reliable housesitters. They are great people to get to know and it was a pleasure spending time with them and showing them very briefly what south Goa has to offer. 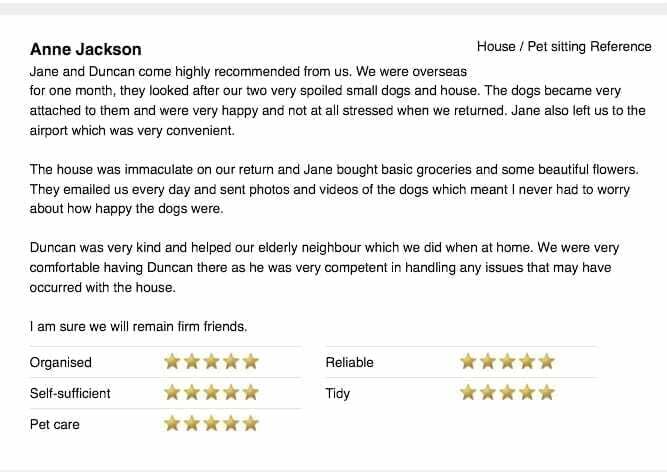 Jane and Duncan were the perfect, happy, friendly couple to dog and house sit for us. Totally trustworthy, tidy and clean ( in fact I think my home was cleaner than when I left it) and took care of our dogs just as we would have hoped. 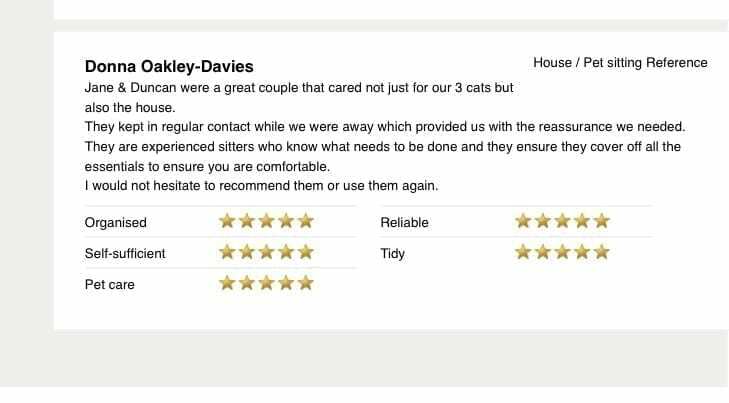 We could not have hoped for better sitters and wouldn’t hesitate in recommending Jane and Duncan to anyone in the future. Jane and Duncan stayed with our 4 goofy dogs for 2.5 weeks. They were great with the dogs, they worked with Leo our problem pup who loved the attention and was noticeably easier to walk when we returned. We appreciate the great care they gave our babies. Duncan and Jane were the perfect house sitters for our casita. They took excellent care of our property and belongings and kept in touch with us regularly. There were some inconveniences that they had to endure here but they took it all graciously with a mellow attitude. We enjoyed learning about their adventures and highly recommend them to everyone. They even took good care of a neighbourhood dog that visits daily for love. Duncan & Jane stayed in our home and cared for our pets (1 dog & 1 cat) for ten days while we were away on vacation. I don’t even know where to begin to tell about how much we adore them and how incredible they are. Not only are they honest, reliable, responsible, caring and kind but they are people who I wish lived right next door. While we were away they sent us daily emails, (mysteriously written by our animals, haha!) which was so comforting and we appreciated greatly. Upon our return, our animals were happy and healthy and our house was sparkly clean. I think our pets were sad to see them go! The entire experience from the initial Skype meeting with them to dropping them off at the Bus terminal was so great. I highly recommend them and feel so lucky to have had them help us with caring for our home and for our pets. Our vacation would not have been nearly as enjoyable without them. Jane & Duncan were our sitters for our 4 yr. old Doberman, Cairo for 2 1/2 weeks this December. Cairo was very well taken care of, received a lot of attention from them and our home and gardens were cared for as well. They communicated with us daily regarding Cairo and also sent photos. They also brought a level of professionalism that we appreciated. We highly recommend them. Jane and her husband looked after our house, dogs, cat, chickens and pool, whilst we were away on holiday for 3 weeks this summer. 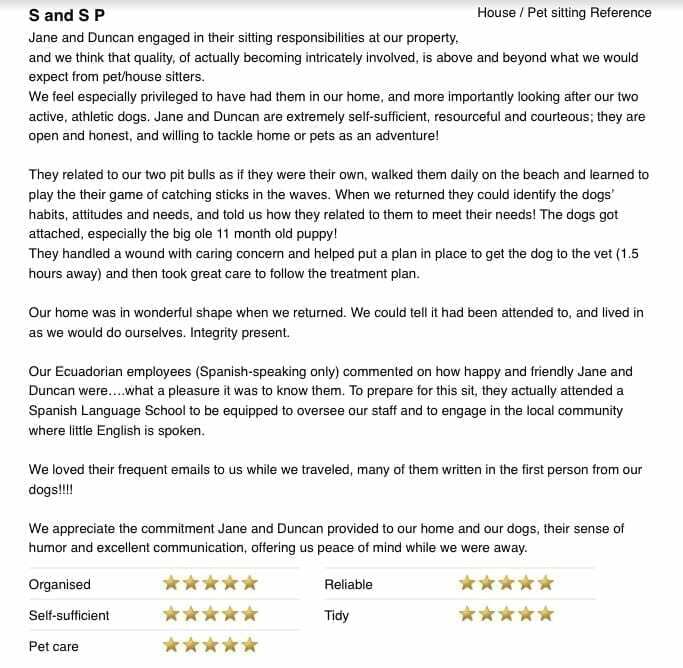 They proved to be excellent housesitters, sending us a detailed planning sheet in advance, keeping in regular contact whilst we were away and obviously caring for our dogs as if they were their own. We returned to a lovely cooked dinner, happy pets and a tidy house. Jane and Duncan took care of our dog and house in September, 2015, in Puerto Vallarta. I had made arrangements with them several months in advance, and they checked in with me occasionally to let me know where they were and that they were ready to housesit for us as agreed. I very much appreciated this, as when things are arranged far in advance, people’s plans can change. When they arrived in Vallarta, they let us know, and were flexible enough that they were able to take care of our dog and house several days prior to the agreed time. There are not enough superlatives to describe them. Personally, they are honest and friendly. It was obvious when we returned that while we were gone, our dog was loved and very well cared for. She was very happy! Jane and Duncan left our house very clean. If they wanted to return to Vallarta in the future, we would love to have them take care of our dog and house again! I am a pretty relaxed person, but when it comes to my dogs…I am hard to please!! 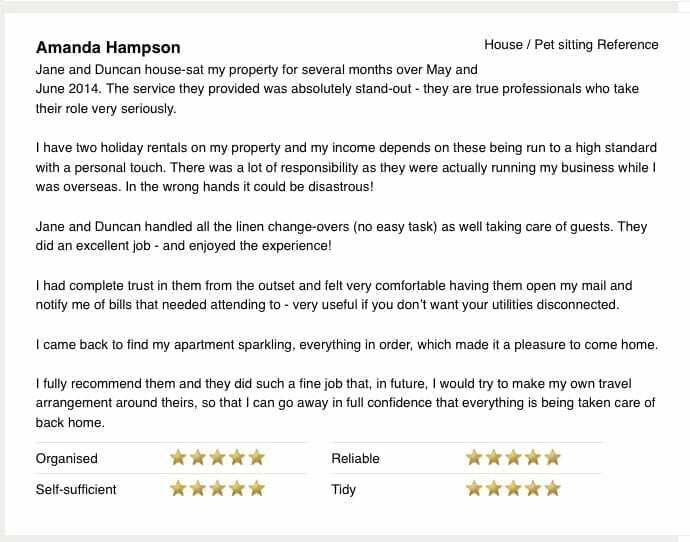 From my very first contact with Jane and Duncan until the day they left, I have been so impressed with their professionalism, organisation and trustworthiness, and as well as that, they are great people! They went over and above what was asked of them and the result was 3 very happy and content doggies and a very happy ‘mum’, who at last could enjoy her holidays without constantly worrying if the dogs were ok! They wrote with updates and photos every day, something which, for me, is very important. The dogs looked so happy! They didn’t seem to miss me at all, which is not usually the case…a testament to how well they were looked after and the love and attention they received from Jane and Duncan. While I was gone, the electricity bill arrived; this was dealt with swiftly and without problems. The house was left spotless (maybe even cleaner than it was when I left!!) and they even left food for me so I wouldn’t have to worry about going to shop for food the day I arrived back…so thoughtful! 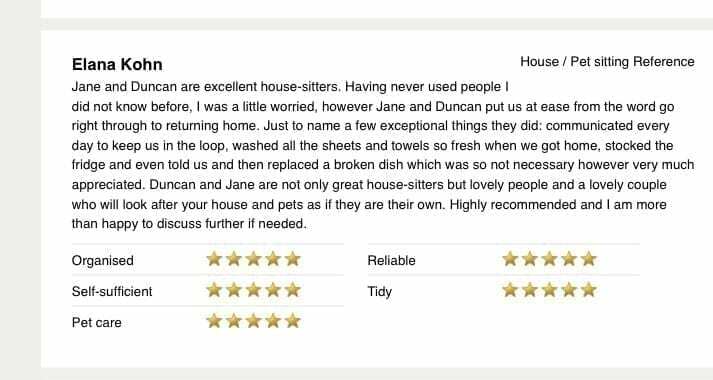 Jane and Duncan are excellent, professional housesitters. You couldn’t ask for more and anyone would be very lucky to have them look after their animals and home. A faultless, 100% positive experience. I would absolutely recommend Jane and Duncan to anyone- they are truly gems. They arrived at my home on the day another house sitter had departed, leaving my home and puppy in a terrible state. We managed to communicate over Skype and got all sorted, how Jane and Duncan remained so calm and professional given this unfortunate arrival is beyond me. I have a large, old colonial home with many challenges as it is mostly an outdoor environment. My gardens are extensive and the daily cleaning/watering duties are substantial. I also have a rather willful puppy ( she is a rescued street dog) who requires a firm hand and much exercise. When I arrived home, Jane and Duncan had my home and garden gleaming and most importantly, my puppy Luna was happy beyond belief. Luna (puppy) was obviously quite attached to her new “masters” and frankly adored them. I could not have felt better. 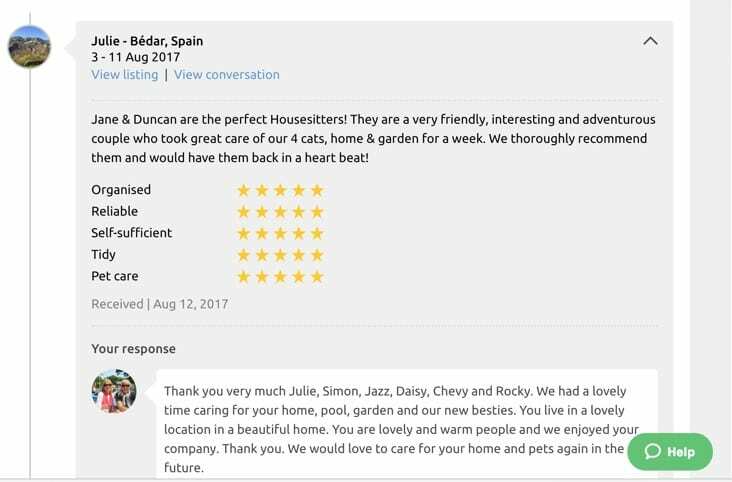 Jane and Duncan were certain to provide me with wonderful, regular updates on how things were going in my home and with Luna. This allowed me to enjoy my vacation, knowing that all was well. A wonderful change from my nervous first week with the first house-sitter in residence. I cannot say enough about these wonderful people and their professionalism and warmth. They understand dogs, take the care of pets very seriously and provide them with love and affection. They will ensure your home is safe and well maintained and that your return is smooth and calm. I feel blessed to have met them and would recommend them for any house sitting opportunity. If I could give them more than 5/5 in every category- I would! Jane and Duncan Dempster-Smith have house and dog sat for me twice in 2015. I was very impressed with the care they gave my two dogs, and the garden fared well too. The house was kept in good order, and I received regular emails from my doggies, sometimes with pictures! Your pets, plants and home are in good hands with the Dempster-Smiths. Thank you, Tanya and John, for your lovely comments.